Do you want to know how to get a job on Binweevils? If so, then you are in the right place because we are going to show you a couple different places where you can work or get a job. Getting a job on Bin Weevils is pretty easy to do. All you have to do is click on the map and click go Rum’ Airport and Tum’s Diner. 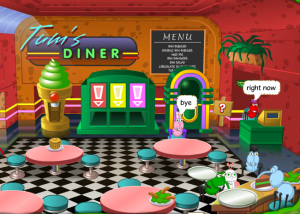 Once you are in Tum’s Diner click on the question mark and it will show you how to become a waiter or become a chef. To become a waiter, click on the stack of trays to pick one up. Then grab a plate of food that the chef has prepared for everyone. Bring the plate of food over to a Bin Weevil that is sitting at a table. Now repeat the process. Congrats, you are now a waiter at the Tum’s Diner. To become a chef at Tum’s Diner jump onto the stool at the front counter. Click the blue disk to bring up the menu on the screen. Next, select the type of food you want to make for the Bin Weevils. Congrats, you just made your first food item as a chef at Yum’s Diner. Watch out short video clip to see exactly how to get a job on Binweevils at Yum’s Diner. 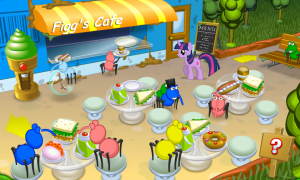 You can also become a waiter at Figg’s cafe. To get a job at Figg’s Cafe click on the stack of empty plates that are on the counter. Then click on the blue disk to pull up the menu on the screen. Now, select the type of food that you want to serve to a Bin Weevil. Pay attention, because some Weevils may tell you what they want. When the food pops up on the counter click on it and bring it over to the Bin Weevil. Well, now you have learned how to get a job on Binweevils. Enjoy working as a waiter or chef at these two restaurants. Let us know which place is your favorite to work at by leaving a comment below.